The Lumisphere® range of patented weather-proof low voltage lighting transformers have been designed especially for use with the Lumisphere® festoon system. The high quality of construction and combination of many unique features make it an ideal choice for most low voltage single or multi-light applications, especially for use in adverse environmental conditions. Lumisphere® transformers have been independently tested by NAMAS accredited laboratories and comply with – BS3535 1.0 1992, – IEC 742 – EN60-742, 1989. Input Voltage 230-250V, 50Hz AC. Output voltage 12V nominal for WP12 & WP12LP ranges, 24V nominal for WP24 & WP24LP ranges. 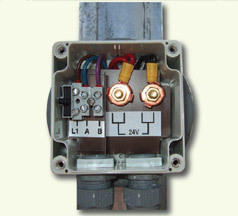 Double protection with self-resetting thermal fuse (120°C) incorporated in windings and replaceable anti-surge type fuse housed in terminal block. Isolation class 2 (double insulated). Conforms to IP55. Entry glands accept cables 6-12mm diameter or multiple Lumisphere™ cables. 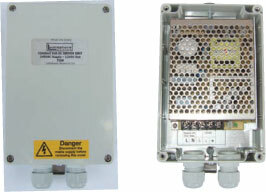 Input and output terminal blocks are separated by insulating divider for safety. 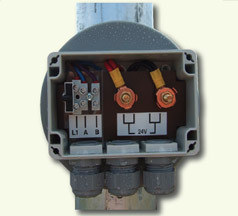 Primary anti-surge type fuse housed in terminal block in removable fuse carrier. See diagrams below. 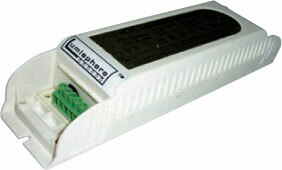 Lumisphere™ transformers are suitable for use in adverse environmental conditions, i.e. 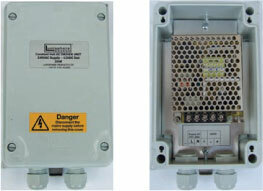 damp, saline, or dusty conditions and can be mounted in exposed positions where severe weather conditions may occur. Maximum temperature rise 50°C, Ambient temperature range up to 40°C with free air circulation around transformer. Maximum case temperature – 90°C. The Lumisphere® range of weatherproof constant voltage driver units have been designed to complement the full range of Lumisphere® LED lighting systems. The constant voltage driver units have an IP55 rated enclosure (when mounted in the vertical position) and are suitable for column or wall mounting. Saline or dusty conditions, can be mounted in exposed positions where severe weather conditions may occur. WPLED100-DP: 100w DC Driver for use with the Lumisphere® dimmable LED festoons. 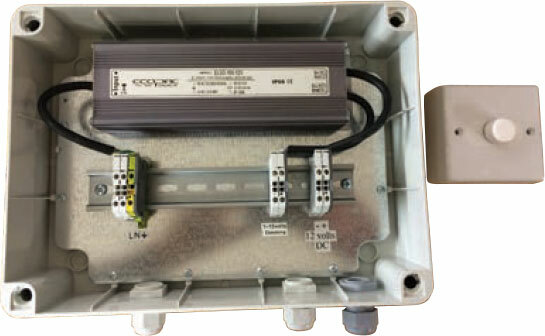 Fully encased in weatherproof enclosure, with rotary switch (to be sited in an interior location) for seamless control.